If you don't know your Bolt Pattern & Offset, enter your Make/Model/Year and we'll ship you what you need. 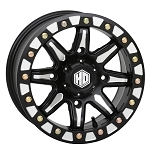 - STI ATV rims are sold individually. - Available in polished or black. - Unique inner and outer heavy-duty wheel lip reinforcement. - Available for most sport ATV's. 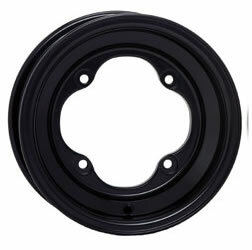 - Great wheel for all applications and terrains. - Lug nuts included with each wheel. Q: Hi there, I'm interested in the STI black rims (rear) for my 1987 Yamaha Banshee. I have been given 18x9.5-8 studded rear tires. I know the bolt pattern is 4/115 for the rear but I'm unclear of the 3+5 offset, I have stock OEM 9 inch on it now and I'm sure they are 3+5. Also, should I run the 9x8 or the 10x8 rims for the tires mentioned? One last question, how much to ship a pair to Whitby, Ontario, Canada? Thanks for your time. A: You will need 8 inch rims to fit your tires. The 10x8 or the 9x8 would not fit. You will need 8x8 or 8x7 rims for the tires you have. Shipping will vary depending on which rims you want. Also we'll need your full address including postal code. You can text or email that to us so we can price out shipping for you.